Our Wood Pole Collection is perfect for the modern classic interior. 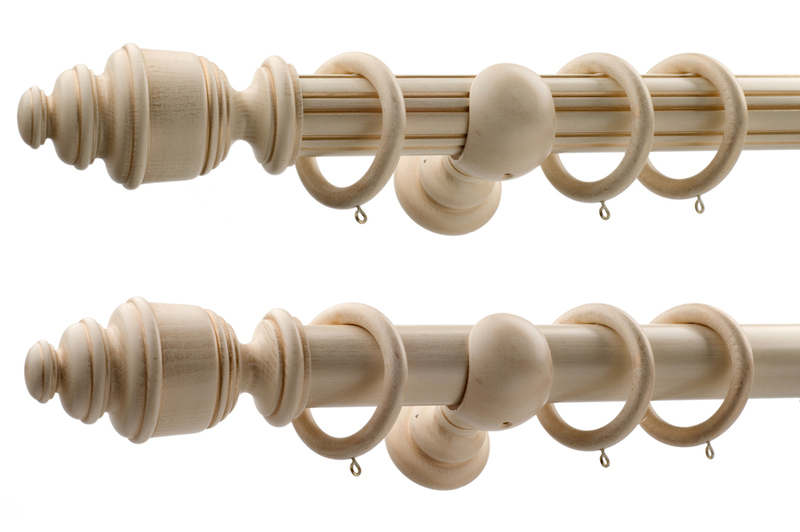 The joy of these wooden poles is that you can spin many of them on their brackets to display the reeded side or the spin again to show the smooth side, the choice is yours. We supply wood poles of varying thickness- 35mm, 50mm, up to 63mm thick. We specify wood poles for straight windows and bay windows (available in 45˚ & 90˚ angle bends). Our Metal Pole Collection is suitable for the slightly more modern interior. As with the wood pole collection, you can spin the metal poles on their brackets to display the reeded side or the spin again to show the smooth side. We supply metal poles from a slim 28mm up to standard 42mm. They are available in various sizes and can include a bend for bay windows if necessary. There are three finial choices- ball; crystal and urn. Our Contemporary Collection is for the ultra contemporary interior, with poles & tracks of a minimalist, architectural finish. These products, made from steel, aluminium and brass make a subtle statement and display attention to detail in their design. Our Virtu Collection includes pieces suitable for a more traditional setting and add a little additional luxury to a window dressing. All the poles from the Virtu Collection are 63mm thick so are ideal for larger or taller windows, and for very heavy curtains. Our Elegance Collection includes a mix of super-contemporary streamline poles and more elaborate decorative French style poles. With a wide selection of end caps, finials, support brackets, rings, tie backs and metal finishes, we can help you determine the right finish for your window dressing right down to the finest detail. There are many more items not shown, please enquire to see more.